Part of my fandom of Japanese culture was learning, which is to say _trying to learn_ the hiragana and katakana alphabets. So while these vehicles are interesting and well rendered, what I find more interesting is my own careful choice of names. Jek is the overarching name of the zaibatsu I invented for these pieces. Think of it like Mitsubishi or Sony. 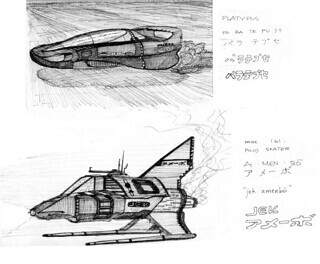 Then, the actual vehicles are named Platypus and Amenbo. Amenbo is Japanese for “pond-skater,” apparently from some language reference on page 191. While Platypus is from the english word, and has been broken up into it’s syllables: pa-ra-te-pu-se. These phonemes, or maybe they’re syllables, then get looked up to their katakana equivalents. Today I’m back to work, and things are pretty good. There’s lots to say but no time to say it. Joe Crawford blogged this at 8:04am in 2005 in August. The 24th was a Wednesday. You are reading this 14 years later. Comment. There are no comments Tweet. Send email. It has hashtags→ drawings memories .